In Charles Tilly’s oft-cited formulation, “War made the state, and the state made war.” In other words, the relationship between insecurity and state capacity is a direct one. As was the case in Europe, the need to fight wars caused states to develop economically and build strong state capacity, which led to the modern state. Yet, as T.V. Paul observes in The Warrior State, Pakistan, a state that has organized itself principally as a national security state, has failed to develop economically and failed to build a strong state capacity. To explain this paradox, Paul develops an innovative argument that states can suffer from a geostrategic curse, which is akin to what has been termed ‘a resource curse.’ Essentially, a resource curse occurs when states that have access to an abundance of resource wealth (e.g., Saudi oil) use that wealth to forestall calls for political reform and economic development by buying off domestic groups. Paul argues that Pakistan has faced an analogous geostrategic curse: because of its strategic importance (during the Cold War, during the War on Terror, and its proximity to the Sino-Indian border), Pakistan has received considerable military aid, which it has been able to use to forestall political and economic change. Consequently, while other national security states have developed strong state capacity in order to wage war, Pakistan has relied on the largesse of others, while resisting calls to modernize. T.V. Paul. The Warrior State: Pakistan in the Contemporary World. Cambridge: Cambridge University Press, 2014. ISBN: 9780199322237 (hardcover, $27.95); 9780190231446 (paperback, forthcoming June 2015, $18.95). The three contributors to this roundtable all agree that Paul has written an important book, which advances our understanding of both the Pakistani experience as well as the process of state-building in general. Thus, Paul Kapur lauds: “There is much to commend in Paul’s approach. He has taken the specifics of the Pakistani case seriously and combined them with relevant insights from international relations theory to produce an analysis that is at once clear-eyed, sophisticated, and accessible.” Douglas Lemke calls the book “a very welcome addition to the debate about state making.” Benjamin Miller observes that the book “makes three types of important contributions”: a theoretical contribution, linking International Relations and Comparative Politics; an empirical contribution, providing rich detail on a crucial case for regional security studies; and a policy-relevant contribution, providing policy advice on how to manage the crisis of state-building in Pakistan. Nonetheless, the three contributors have questions for Paul and aspects of his argument they would like him to develop further. In particular, both Kapur and Lemke press Paul on his central causal argument by exploring the uniqueness of the Pakistani case. For Kapur, the uniqueness of the Pakistani case casts doubt on Paul’s claim that Pakistani problems are caused by the rents it extracts due to its geostrategic position. For, if such states suffer from a geostrategic curse, why would other states that occupy similar positions (such as Turkey, a case discussed in The Warrior State) have escaped the state weakness that Pakistan has experienced? For Lemke, Paul needs to address one of two possibilities. First, it might be too early to tell if military threats have prevented Pakistan from developing; many of Tilly’s European states also began as failing states, but over time used their security threats to build impressive state capacity. Second, perhaps Pakistan is not an anomaly for Tilly, but is much like dozens of other European states throughout history that failed to adapt and were swept away by those that did. If so, Paul’s argument must be read as a complement to Tilly’s theory, rather than as a competitor. Finally, Miller suggests that further development is necessary to clarify and specify the relative causal impact of different explanatory elements of Paul’s argument: realism versus nationalism in Pakistani motives; material factors (geopolitical location) versus ideational factors (Pakistani leaders’ worldview); and the characterization of Pakistan as a revisionist state versus its status as a failing state. Paul’s serious effort to address these concerns in the limited space of this forum helps move the discussion forward. Paul elaborates the conditions under which geostrategic rents become a liability and his comparative study of Egypt and other cases in East Asia helps clarify his argument. Finally, he makes an effort to link his structural explanation with the strategies and ideas elites hold to explicate the conditions under which aid becomes a curse or a blessing. Taken together, Paul’s book and this forum are useful contributions that should inform both the theoretical debate on the relationship between war and state formation and the policy debate about Pakistan for years to come. T.V. Paul is James McGill Professor of International Relations in the Department of Political Science at McGill University, Montreal, Canada. Paul is the author or editor of 15 books and over 55 scholarly articles/book chapters in the fields of International Relations, International Security, and South Asia. He is the author of the books: Warrior State: Pakistan in the Contemporary World (Oxford, 2013); Globalization and the National Security State (with N. Ripsman, Oxford, 2010); The Tradition of Non-use of Nuclear Weapons (Stanford, 2009); India in the World Order: Searching for Major Power Status (with B.R. Nayar Cambridge, 2002); Power versus Prudence: Why Nations Forgo Nuclear Weapons (McGill-Queen’s, 2000); and Asymmetric Conflicts: War Initiation by Weaker Powers (Cambridge, 1994). A former Vice-president of the International Studies Association (ISA), Paul currently serves as the editor of the Georgetown University Press book series: South Asia in World Affairs. Norrin M. Ripsman is a Professor in the Political Science Department at Concordia University in Montreal, Canada. He is the author of Peacemaking by Democracies: The Effect of State Autonomy on the Post-World-War Settlements (University Park: Penn State University Press, 2002), a co-author (with T.V. Paul) of Globalization and the National Security State (New York: Oxford University Press, 2010), a co-author (with Jean-Marc F. Blanchard) of Economic Statecraft and Foreign Policy: Sanctions and Incentives and Target State Calculations (London: Routledge, 2013).a co-editor (with Steven E. Lobell and Jeffrey W. Taliaferro) of Neoclassical Realism, the State, and Foreign Policy (Cambridge, U.K.: Cambridge University Press, 2009) and The Challenge of Grand Strategy: The Great Powers and the Broken Balance Between the World Wars (Cambridge: Cambridge University Press, 2012), a co-editor (with Jean-Marc F. Blanchard and Edward D. Mansfield) of Power and the Purse: Economic Statecraft, Interdependence, and International Conflict (London: Frank Cass, 2000), and the author of numerous peer-reviewed journal articles in International Security, International Studies Quarterly, Security Studies, Millennium: A Journal of International Studies, International Interactions, International Studies Review, Geopolitics, International Journal, and The Canadian Journal of Political Science. Paul Kapur is a professor in the Department of National Security Affairs at the Naval Postgraduate School. He is the author of Dangerous Deterrent: Nuclear Weapons Proliferation and Conflict in South Asia(Stanford University Press, 2007); and, with Sumit Ganguly, India, Pakistan, and the Bomb: Debating Nuclear Stability in South Asia (Columbia University Press, 2010). His work has also appeared in journals such as International Security, Security Studies, Asian Survey, Nonproliferation Review, Washington Quarterly, and Asian Security, as well as in numerous edited volumes. Professor Lemke earned his Ph.D. at Vanderbilt in 1993, and has taught at Penn State since 2004. His research has appeared in American Journal of Political Science, International Studies Quarterly, Journal of Peace Research, Journal of Conflict Resolution and World Politics. His book Regions of War and Peace has been published by Cambridge University Press, and he has also edited a book, Parity and War, with Jacek Kugler (University of Michigan Press). Benjamin Miller is Professor of International Relations at the School of Political Sciences, and the Head of the International MA Program in Peace and Conflict Management at the University of Haifa. His published books include When Opponents Cooperate: Great Power Conflict and Collaboration in World Politics (Ann Arbor, Michigan: The University of Michigan Press, 2nd ed., 2002); and States, Nations and Great Powers: The Sources of Regional War and Peace (Cambridge: Cambridge University Press, 2007). In The Warrior State: Pakistan in the Contemporary World, T.V. Paul takes the reader on a detailed tour of Pakistan, which includes in-depth discussions of Pakistani history, culture, religion, politics, and economics. The journey is interesting in itself, but Paul does not take it for that reason alone; he has a much larger agenda in mind. Paul wants to explain why Pakistan, the world’s second-largest Muslim country and a nuclear-armed state, finds itself in its present condition – a condition characterized by destructive competition with India, religious extremism, civil strife, praetorianism, and chronic underdevelopment. Implicit in the project is the notion that we cannot know why Pakistan behaves the way it does, and finds itself in its current predicament, without a thorough understanding of its internal workings, past and present. There is much to commend in Paul’s approach. He has taken the specifics of the Pakistani case seriously and combined them with relevant insights from international relations theory to produce an analysis that is at once clear-eyed, sophisticated, and accessible. Non-specialists will learn a great deal from the book about Pakistan and the international security environment in South Asia. Specialists will debate the book’s theoretical arguments regarding the relationship between strategic resources and dysfunctional politics, in Pakistan and elsewhere. In short, this is a book that will be widely useful. Since I agree with many of Paul’s arguments in The Warrior State, in this review I will make just two points. The first will address Pakistani strategy and the second will address the causes of Pakistan’s current plight. Regarding strategy: In the book, Paul rightly emphasizes Pakistan’s use of violent non-state actors against India, pointing out the important role that this strategy has played in Pakistani security policy. He makes clear that Pakistan’s adoption of this strategy was a deliberate choice, and that, despite its significant problems, it has achieved a number of successes for Pakistan. These are important points. Much of the academic and policy literature casts Pakistan’s militant strategy as having emerged almost by accident, as the result of inexorable social and political forces beyond Pakistani leaders’ control. In addition, many characterize the strategy as having been an unmitigated failure. Both of these contentions in the literature are misleading. As Paul compellingly argues, the use of militants has been a deliberate policy that has enjoyed at least partial success over the years. Paul might make these points even more strongly than he does by tracing Pakistan’s militant strategy further back in Pakistani history. In the book, he follows the strategy to the 1980s and the eruption of the Kashmir insurgency. He could have looked back to the very founding of the Pakistani state, when the Pakistanis recruited Afridi tribesmen to march on Srinagar in hopes of capturing Kashmir from India. Moving forward, Pakistani use of militants have figured prominently in every India-Pakistan conflict except the Bangladesh war, becoming more sophisticated and prominent each time. The strategy has enabled the Pakistanis to challenge territorial boundaries while minimizing the danger of catastrophic defeat, generated a domestic political cohesion within Pakistan, and ensured that the Kashmir dispute has retained an important place on the international community’s agenda. Thoroughly discussing the genealogy of Pakistan’s militant strategy is important both because it can help us better to understand Pakistani behavior in numerous cases and also because it makes clear just how deep-seated Pakistan’s relationship with militancy really is. It has been a prominent driver of Pakistani strategic behavior since the birth of the Pakistani state. As a result, its habits, structures, and pathologies run extremely deep. This, in turn, is one of the main reasons why it is so hard for the Pakistanis to abandon this behavior. Pakistan has simply never had a grand strategy that did not rely on the use of militant proxy forces to combat India, alter South Asian territorial boundaries, and shape the larger regional security environment. A bit more historical context thus could make Paul’s important points about Pakistan’s relationship with militancy even more compelling. In terms of causes, the central question of The Warrior State is why Pakistan has adopted the pathological political and military strategies that are responsible for its current predicament. Paul attributes Pakistan’s problems primarily to the structure of Pakistan’s strategic environment. He calls this Pakistan’s “geostrategic curse” (18). Paul argues that Pakistan’s valuable geostrategic assets – mainly its position in an extremely important part of the world – result in it receiving a great deal of support from powers like the United States and China, which are anxious to exploit Pakistan’s assets for their own purposes. This creates perverse incentives for Pakistani leaders, who are able to live off the rents that come with Pakistan’s position, without having to worry about devising effective foreign and domestic policies – policies that might mitigate or eliminate many of the country’s current problems. The failure of Pakistani leaders to devise more successful policies is without question a major problem. But does it result from the geostrategic curse that Paul identifies? Based on Paul’s excellent analysis of a number of other countries in The Warrior State, one might wonder whether the curse is the true cause of this failure. Those other states, much like Pakistan, enjoy significant strategic advantages, including generous foreign patronage. Nonetheless, they have managed to avoid many of Pakistan’s most damaging political and social pathologies. Let us examine just one prominent example from the book: Turkey. Like Pakistan, Turkey is strategically blessed. It is located in an important part of the world, receives massive aid from the United States, and is even a part of NATO. But as Paul points out, Turkey has been spared many of the problems that plague Pakistan. Its security policy is not overly ambitious. It has not been taken over by religious extremism. The role of its military in domestic politics appears to be receding. And it has been able to provide its population with a reasonable level of domestic development. Why is this the case? Paul points to a number of reasons, including the Turkish leadership’s generally pragmatic approach to security matters, their rejection of an overly competitive approach to international politics that he calls “hyper-realpolitik,” (3) and their desire to create a broadly secular, modernizing state. If Paul’s analysis is right and these factors explain the difference between Turkey and Pakistan, however, this would suggest that the geostrategic curse is not primarily responsible for Pakistan’s current predicament. For both Pakistan and Turkey enjoy major strategic endowments, and in fact collect significant rents on them. Nonetheless, the two countries have gone in very different directions. The fact that a state profits from structural strategic advantages, then, does not mean that it will turn into a Pakistan. Instead, it might become a Turkey, if its leaders have similar preferences to those that Paul identifies as motivating the Turkish leadership. Perhaps, then, the geostrategic curse is less important to explaining Pakistan’s present situation than factors such as the preferences of its political elites. Let me suggest one other way of assessing the importance of Pakistan’s geostrategic curse. The Warrior State strongly implies that if Pakistan had not suffered from the curse and the perverse incentives that it created for the Pakistani leadership, Pakistan would have stood a good chance of evolving into a more ‘normal’ state, which governed according to liberal principles and pursued developmental instead of hyperrealist goals. As Paul writes, “Pakistan’s success in tapping into the geopolitical dividend . . . prevented the elite from launching deep reforms or seeking a more sustainable developmental path, including international trade” (151). If this is true, however, a counterfactual exercise, in which Pakistan’s geostrategic endowments are significantly reduced, should yield very different outcomes than the ones that Pakistan has actually experienced. For example, a strategically poorer Pakistan should recruit better leaders who avoid or do away with praetorianism, devise modest security policies, and adopt development strategies that provide basic public goods for the population. How likely is it that this would have happened in a less well-endowed Pakistan? What evidence do we have that such a Pakistan would have achieved outcomes any less pathological than the ones that it is experiencing now? The unhappy truth may be that the country’s lack of a coherent founding narrative, material disadvantages relative to India, ethnic divisions, feudal social structures, endemic corruption, frontier political and legal heritage, and pathologically selfish political class would have led even a geostrategically poorer Pakistan to much the same place that the country is in now – with even fewer advantages than the Pakistan of today. I offer these comments solely in the spirit of discussion and look forward to the author’s reply. Regardless of my questions and suggestions, T.V. Paul has written an honest, informative book that combines deep regional expertise with broad theoretical insights. It will significantly advance the academic and policy debate regarding Pakistan and other similarly situated states. I hope that our colloquy in these pages can make a modest contribution to that process. A popular summary of the bellicose theory of state making is that “war made the state and the state made war.” Bellicose theory expects that security threats provoke governmental efforts to extract resources from society, with which to enhance military and organizational strengths. The population expects some return for their tax contributions, so administrative institutions are created to provide order and services to the public. These in turn strengthen the state by fostering economic development, which increases the tax base, thereby enlarging the resources the state can use to meet its security threats. War (and preparation for war) and state making progress in tandem. Such claims create an expectation that Pakistan should be one of the best made states in the international system. Decades of foreign and domestic security threats should have justified the extraction of substantial tax revenues from the population, and, in order to survive, Pakistan should have used those revenues to build a strong and capable state. In reality, though, Pakistan is one of the weakest states in the world. Pakistan’s paradoxical state-making experience is the subject of T.V. Paul’s The Warrior State, an interesting book on an important topic. Paul argues that Pakistan’s security threats have not generated strong state structures because Pakistan occupies an important geostrategic niche in American and Chinese foreign policy. During the Cold War, particularly during the Soviet invasion of Afghanistan, Pakistan was a bulwark against communist influence in south Asia, and America pumped in military aid. After the Cold War the U.S. continued to support Pakistan financially as an ally in the War on Terror. Simultaneously, China saw Pakistan as a counterweight to India, and has aided Pakistan militarily. The easy influx of large amounts of military aid eliminated Pakistan’s need to draw resources from its population, and thus rendered unnecessary the construction of strong state structures. Akin to a resource-cursed oil-exporting state, Pakistan is institutionally weak due to what Paul calls a “geostrategic curse” (5). In 239 well-written pages, Paul convincingly develops his argument about Pakistan’s geostrategic curse and explains how this contributed (along with the elite’s hyper-realpolitik ideas) to Pakistan becoming a Warrior State (the state’s main function is to support the military). In addition to comparing Pakistan’s state making to that of Europe, he also provides detailed comparisons with a number of other states whose similar geostrategic situations make them candidates for Warrior State status. If Paul is right, we need new theories to explain state making in the post-colonial world. If he is overstating Pakistan’s generalizability, then bellicose theory might still be of use. Claims against the applicability of bellicose theory to post-colonial state-making are not unique to Paul’s book. In fact, the vast majority of non-statistical analyses of war-and-state-making conclude that war and preparation for war no longer contribute to state making. In contrast, all statistical analyses find some relationship between security threats and the strength of governments (both variously measured, and with varying samples and research designs). How might we explain the divide between case studies and statistical analyses? I think it most likely that the modest relationships found in the statistical studies do not produce sudden sharp advances in state capacity. A weak statistical trend is hard to spot across a short timeframe. Extrapolated over many decades, or centuries as in Europe’s state-making experience, it becomes easier to recognize that state-making is being achieved. This suggests that non-statistical analyses of bellicose theory, like Paul’s, are biased against recognizing a relationship between security threats like war and the development of state structures. And yet, Pakistan is a very poorly made state. It might be the best candidate for discrediting bellicose theories of state making (Somalia and the Democratic Republic of the Congo are other good candidates). But, even its drastically bad state making record might not be all that exceptional. If one were to select France during the Hundred Years’ War as a case study, it would be hard to see war contributing to a strong state. And yet, France’s longer-term experience is one of Charles Tilly’s (and other specialists on European state making like Edgar Kiser’s) exemplars. All of this is to suggest that Paul’s rejection of bellicose theory might be premature. Additionally, Pakistan’s emergence as a Warrior State instead of as a Developmental State might be an anomaly. This is suggested by Paul’s comparison of Pakistan with a series of other geo-strategically “cursed” states (Chapter 7). Israel, Egypt, South Korea, Turkey, Indonesia, and Taiwan all face or faced substantial, even existential, security threats, and all featured prominently in the geostrategic calculations of the great powers. And yet, none of them became Warrior States, while some of them (Israel, South Korea, Turkey, Taiwan) have already become well-made states. Paul points out various plausible differences: foreign rivals were not vastly superior, the elites were pragmatic rather than extremist, foreign aid was geared toward pacifying relations, Japanese colonialism left better infrastructure in its wake than did other colonizers, etc. Each of the comparisons is convincing, but cumulatively they raise the question of whether any other state in the world has become a Warrior State like Pakistan? Perhaps it is not a coincidence that Paul titled the book “The” rather than “A” Warrior State. Of course, the easiest way to claim support for bellicose theory is to argue that Pakistan is well on its way to satisfying bellicose expectations. Specifically, bellicose theory anticipates that external threat will cause leaders to try to strengthen their institutions in order to enhance their survival prospects. When leaders fail at this important task, they lose their states. With respect to Europe: “(b)y 1900 there were around twenty times fewer independent polities in Europe than there had been in 1500. They did not disappear peacefully or decay as the national state developed; they were the losers in a protracted war of all against all.” Bellicose theorists might anticipate that Pakistan will go the way of Europe’s many unsuccessful state makers. Indeed, Professor Paul recognizes that “today, powerful warlords control many parts of the country.” (13) He closes his book with the chilling prediction that “if the military and its intelligence agency persist in “double games” and keep supporting terrorism, Pakistan will eventually fall apart…” (197) Given prevailing international norms, it is unlikely that Pakistan would die via external conquest, but it is possible that some other state making entity (perhaps one of the warlords?) could emerge from the current state’s ashes. I close with a disclaimer of sorts. I have engaged Professor Paul’s claim that Pakistan’s experience discredits bellicose theory in the post-colonial world not because I am particularly enamored of bellicose theory (certainly not normatively). Rather, I have raised doubts about the generalizability of Pakistan’s experience, and pointed out that a worst-case scenario would be consistent with bellicose theory, because I prefer not to reject an accepted theory unless there is over-whelming evidence that the theory no longer applies. While I am not persuaded by Paul’s claim that bellicose theory is discredited by Pakistan’s experience, I nevertheless find his book a very welcome addition to the debate about state making. The topic is not only intrinsically interesting, it is fundamentally important, with massive implications for the lives of people living in Pakistan and elsewhere. This book makes a key contribution to the often-overlooked linkages between international relations and comparative politics; by investigating the complex Pakistani case, Professor TV Paul addresses an important case of the relationship between the field of war and security studies and the key comparative politics issues of state-building, nation-building and development. More specifically, the book advances a number of substantive contributions. In contrast to the classical European cases of the eighteenth and nineteenth centuries, war-making/security obsession in Pakistan did not result in state- and nation-building. A major manifestation of this failure includes the lack of control over parts of the sovereign Pakistani territory. Rather than ruled by the state institutions, these territories are subordinated to warlords and armed groups. Pakistan is also a hotbed of international terrorism. A major limitation to a successful state-building is the very limited tax collection, since the ability of the state to raise taxes is a major pre-requisite to its success. Thus, the ability of the state to provide services to its citizens is quite limited. At the same time, the ethno-national tensions among various groups in the country demonstrate the lack of congruence between state and nation, and thus the failure in building a cohesive nation, which would see the state as reflecting its national aspirations and is loyal to its institutions. By advancing this analysis, Paul shows the limitations to Charles Tilly’s thesis (that “the state made war and the war made the state”) in the contemporary, especially post-colonial developing world. Other scholars have already shown the prevalence of weak and failed states in this part of the world. Yet their argument, at least partly, was that this weakness resulted from the rarity of inter-state wars there (for a recently published related argument, see Boaz Atzili’s Good Fences, Bad Neighbors), while this kind of wars was the cornerstone of Tilly’s state-building in Europe. Yet, Paul demonstrates that a state can be a failed one even if it has already fought three major inter-state wars (the wars with India in 1947, 1965 and 1971) and a more limited war in 1999 (with India in the Kargil war). This is a very important argument, which challenges the applicability of the European model to the Third World, namely it shows the limits to the idea of a state/nation-building via war even if that war is an inter-state one. The book shows how a state’s security obsession can adversely affect its socio-economic development, welfare and democracy. Pakistan is a major example of how too much focus and investment in military security can be harmful to other important values and objectives as was the case, for example, in the former Soviet Union. Thus Pakistan is one of the least globalized countries in the world and is low in Human Development and global competitiveness. Its key “contribution” to globalization is in the negative sense of serving as a hotbed of international terrorism (14). On a more general level, Paul contrasts two models of a state: one which is war-making/garrison state/security-obsessed/hyper-realist, manifested, among other things, by excessive defense spending and reliance on foreign aid; while the other is the trading or development state, which is much more integrated into the global economy and its human development accomplishments are much more impressive. As Paul portrays it, not only is the socio-economic outcome much more favorable to the latter, but the security in the state might also be in much better shape in the second type of a state. This is based on a logic similar to the idea of the “resource curse,” but in this case it is due to the state’s geostrategic location or its realpolitik value for these powers. Thus, Paul develops the novel and useful concept of the “geostrategic curse.” The idea is that geopolitical benefits manifested by rent payment or foreign aid from the great powers lead to disincentives to invest and innovate in development and to initiate far-reaching socio-economic reforms. Thus, the end result is the lagging behind in development, and achieving relatively limited volumes of trade and globalization (5-6). The first issue is the tension between a revisionist state (such as the Pakistani grand strategy vis-à-vis India with regard to Kashmir) and a failed state (Pakistan being confronted on its sovereign territory by violent non-state actors). In turn, these two different types of war-prone states differ from a status-quo/peaceful state. It would be useful to explain the conditions under which each one of these models is more likely. Another tension is between material (notably, the geo-political location of the state leading to its “geo-strategic curse”) versus ideational factors (such as the worldviews of the leadership or the elites; and also nationalism). It seems that in the eyes of the author, it is the leadership with its ‘operational code’ which is the key variable that differentiates between a war-making state and a development/trading state. This idea should be further clarified and developed theoretically: notably the interrelationships between the material and the leadership/ideational variables. Moreover, it seems that occasionally there is some confusion between realism and nationalism as the key source of Pakistan’s grand strategy. However, these two motivations are quite different: in realism the state behaves according to the imperatives of the balance of power—whatever they are in a specific situation, and thus the state behaves prudently and is cautious when it confronts a more powerful neighbor; while in nationalism the state pursues objectives– such as the unification of the members of the nation, including those who live in neighboring states– even if these objectives are costly and contradict the logic of the balance of power. A key example of such a pursuit refers to Pakistan’s attempts to gain control over India’s Kashmir—with its Muslim majority— even though India is a more powerful state. This is because Pakistan views itself as the country, which represents all the Muslim-majority provinces of the former British India. An additional issue to be further explored refers to the relationships between military security and the economy: while it is true that in quite a few cases security obsession can lead to a weakening of the state or even its bankruptcy, the book overlooks the potentially great economic gains which can be derived from an investment in security. Key examples in recent times of such economic benefits are the high-tech industries and developments in the U.S. and Israel, which have in different stages benefited quite a bit from investments in certain branches of the military such as intelligence, communication and the air-force. These gains are in contrast to the relative lagging behind in high-tech of some otherwise developed European countries, which were traditionally ‘free-riders’ under the US security umbrella and thus did not develop comparable capabilities to those of the U.S. and Israel in this domain. Nation-building is another subject which requires more research. Paul highlights some of the key factors which led to the great failure in the Pakistani nation-building. Among other things, Pakistan has to confront the challenges of secession from the Baluchis and Pashtun. Still, one has to acknowledge the difficulties of nation-building, let alone homogenization, of population in the late twentieth and —early twenty-first centuries: it is much more difficult in the current period to homogenize the population because of mass political mobilization and the stronger inclination to preserve ethno-national identities than was the case in the earlier periods of European nation-building. At any rate, an interesting research agenda might address the conditions under which nation-building can be more successful. A partly related topic refers to the variations among security-minded, war-making states based on the level of internal ethno-national congruence (or to what extent the population is homogenous in its national identity). Pakistan might be among a group of nationally incongruent states in the Third World, while three of the more successful economically security-minded states have been all along much more internally congruent: Taiwan, South Korea, and Israel (in its pre-1967 boundaries). While it might be quite an overstatement to claim that the only or even the key reason for variations in economic success are due to this factor, the internal national congruence might have helped the economic development of these cases, though Taiwan and S. Korea suffer from external incongruence due to their partition from mainland China and N. Korea respectively. This might also be an interesting area of further research. A final area to be developed is regional security and strategic interdependence—while it is very useful to analyze a pivotal state such as Pakistan in a thoughtful and comprehensive way as is done here, it is also essential to place the state under investigation in the regional security context, which is usually the key for questions of war and peace. In this context it will be useful to address the sources and effects of the strategic interdependence in the South Asian region and particularly how it affects the likelihood of escalation to large-scale violence and the way to resolve conflicts peacefully. One of its key contribution is theoretical, enhancing the links between Comparative Politics and IR in domains which were until recently overlooked. Another major contribution involves the field of regional security studies—an in-depth study of a crucial state for regional—and international—security purposes. And finally, the book makes policy-relevant recommendations which are useful especially with regard to highlighting the trade-offs between military security and trade and development. 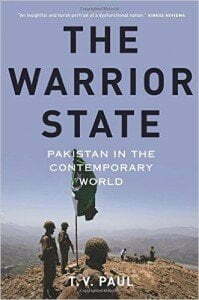 The reviews by Paul Kapur, Douglas Lemke, and Benjamin Miller of my book The Warrior State: Pakistan in the Contemporary World are thoughtful and thorough. I appreciate the reviewers’ careful reading of the book and willingness to highlight its strengths, as well as weaknesses. In this brief response I will take up the criticisms leveled by the three reviewers. Paul Kapur is right in arguing that Pakistan has used non-state actors in all the wars it has waged with India. In 1947-48 and 1965 in particular there was use of non-state actors, in the latter instance, this use was based on expectations of an uprising in Indian Kashmir. Non-state actors were used in the anti-secessionist campaign in Bangladesh as well. I do mention briefly the involvement of tribal forces in the first Kashmir war. The difference, though, is the extent and depth of involvement of the non-state actors, as well as the techniques they have used since the 1980s which are different from previous instances. It was military ruler General Zia ul Haq’s policies after the end of the Afghan war that allowed the creation of active groups that engaged in continuous intervention in the Indian Kashmir and elsewhere. The use of jihadists from other parts of the Muslim world is also a difference from previous cases. Prior to 1989, only in very few instances did terrorist groups sponsored by Pakistan engaged in random violence inside other parts of India or in Kashmir. Kapur’s other criticism is that “the geostrategic curse” that I identify may not be the true cause of Pakistan’s failures. He argues that other countries such as Turkey have used geopolitical relations with great powers to their advantage. I recognize this variation and attempt to explain it in chapter seven. It is in this context where the ideas and strategies of the elite matter. I make it abundantly clear that if the Pakistani elite held the developmental state ethos of East Asian, and to some extent Turkish, rulers, they could have turned the geopolitical connections with great powers to their advantage. They needed to undertake land reforms, put adequate money into education, and develop an export-driven strategy along with fostering their military strength. But the Pakistani elite’s ideas, deriving from a peculiar strategic culture, i.e. a Hobbesian worldview colored by Islamist notions of warfare, a narrow national understanding of the purposes of the state, an affection to territoriality at the expense of economic prosperity, and British-era ideas of the vassal state in Afghanistan all contributed to the failure to use geopolitical links as an advantage for the country’s greater development. Moreover, the economic role and the goodies the military gained as a corporatist group are also discussed in order to explain this variation. Compared to the other cases, land reforms never took place in Pakistan. So, it is not a purely structural argument, as we need to bring in agency to show why the elite ended up pursuing such policies. I think Kapur had misread my argument and the review does not appreciate the linkage I develop between structure and agency. This is perhaps one of the major contributions of this book, unlike the literature on the foreign aid curse, geopolitical rents etc. that does not often develop the connection between the two levels of analysis. Kapur cautions that if the rents were not available, Pakistan would still have exhibited these pathologies. I am not completely sure if that criticism is all that valid. If resources were not readily available, the elite would have needed to find other sources somewhere else. Internal extraction could have been one route. Trade could have been another. In this case, both strategies were avoided. The availability of easy money precluded the elite from reforming the economy or the political order, and this is a well-established argument developed by scholars of the resource and foreign aid curses. Counterfactual arguments are wild guesses and there is no way to confirm a particular alternate route the elite would have undertaken. Moreover, counterfactual analysis would also have to be performed on the alternative variables of choice. Kapur puts together a bunch of variables without showing what would have been the most salient ones in such a counterfactual scenario. I believe I have put forward a strong argument and offered much evidence in its support, and until the counter argument is produced with sufficient evidence, I am comfortable with mine. In many respects, Pakistan is not an easily comparable state. There are only a handful of cases of this extreme nature. The cases that I can think of are Egypt, the Philippines, and Cold war-era Ethiopia and Somalia. The absence of potential cases does not make the analysis of Pakistan an irrelevant exercise, as this is a very crucial case, given this country’s significance to regional and international security orders. That brings forth the criticism of Douglas Lemke. I strongly believe that the time element today is compressed for countries to develop as strong states. It does not take 400 years as Europe did. Furthermore, there is no guarantee that with a longer time span countries will get stronger. Look at Latin American countries that lived under military rule for over 100 to 150 years. Compare them with the East Asian states: China, Korea, and Taiwan that progressed in less than two decades. Pakistan itself shows six decades of war making that have not produced a better outcome, but rather progressive decline or stagnation, despite showing some promise during the Ayub-Khan era in the 1960s. My aim in this book is not to fully discredit the theory on war and state making. I believe I am offering a richer explanation for the conditions under which war making can be debilitating, and also when it can be beneficial. In the post-World War II era, those states that adopted a developmental-state approach benefitted from security competition and geopolitical links with the great power system. None of the quantitative studies that Lemke suggests offer this kind of variation. Even those studies that apply the logic to Africa and Latin America (e.g., that of Jeffrey Herbst or Miguel Centeno) do not show what else was needed for countries to become stronger. Benjamin Miller’s criticisms center around the need for further clarification of ideational and material variables. I believe I develop this in each chapter with the help of a variety of instances and anecdotes, although the style of presentation is different for a trade book such as this. While it is true that Pakistan pursues nationalist goals which need not be consistent with classical realist cannons of prudence, it also chases intangible goals such as status and revenge for alleged misdeeds by India, and a revisionist strategy using jihadists and other non-state actors. It is hard to call this pure realism or nationalism; it is instead an overly ambitious grand strategy by a deeply embedded, clever elite in a poor country. Social-psychological theories may be necessary to discuss the pathology more clearly. I also have no problems with the argument that security ties with the U.S. have been used by allies such as Israel for technological development. It would be interesting to see if the U.S. ever thought of offering Pakistan such options given the possible reactions from India, something the U.S. does not have to worry about with Israel. Pakistan does not possess the industry, scientific talent, or the ethnic links that the U.S. shares with Israel. There is also the absence of a powerful electoral segment of Pakistani origin in the U.S. in support of wider relationship, as is the case of the greater Jewish diaspora. Miller also argues that lack of ethnic homogeneity may be a constraining factor. This has partial validity. But looking at India and Indonesia, it is not clear why these states have progressively unified their countries and constrained the power of ethnic nationalists. I would argue (as I do in the book) that it is the adoption of intensely coercive, instead of integrative, approaches that led to the problem of Baluchistan presently, and the East Pakistani secessionist movement previously. It is not multi-ethnicity per se, but the strategy of the elite on how to unify such a society that is the culprit here. I do not want to claim that my book offers the final word on Pakistan. I have been frustrated by the fact that social scientists have ignored this crucial country, leaving the territory to journalists and think-tank scholars who have yet to explain why Pakistan is the way it is. I have used the Charles Tilly logic as a foil to show the different outcomes in the developing world when it comes to war and state building, something Tilly himself acknowledged in his later work. More scholarship is needed to explicate this relationship in the contemporary world and I have no problems if someone else can explain the Pakistani predicament better through some other causal mechanism. The more the merrier. Policy-relevant causal arguments are needed for this very crucial nuclear-armed country. Otherwise, its elite is likely to continue the disastrous economic and security policies that are hurting their own people, the region, and the world at large through their double games, support for transnational terrorism, use of jihadist groups for warfare with neighboring countries, brinksmanship policies, and a tendency to spread nuclear weapons materials and potentially use nuclear weapons. Charles Tilly, The Formation of National States in Western Europe (Princeton, N.J.: 1975), 42. The main citation for bellicose theory is Charles Tilly. Coercion, Capital, and European States (Cambridge, MA: Blackwell, 1990). See, inter alia, Miguel Angel Centeno, Blood and Debt,” American Journal of Sociology 102, no.6 (1997):1565-1605; Jeffrey Herbst, States and Power in Africa (Princeton, NJ: Princeton University Press, 2000); and Georg Sorensøn, “War and State Making,” Security Dialog 32, no. 3 (2001): 341-354. See, inter alia, Karen Rasler and William Thompson, “War Making and State Making,” American Political Science Review 79 no. 2 (1985):491-507; Cameron Thies, “State Building, Interstate, and Intrastate Rivalry,” International Studies Quarterly 48, no. 1 (2004):53-72; Charles Boehmer and David Sobek, “Violent Adolescence,” Journal of Peace Research 42, no. 1 (2005):5-26; David Lektzian and Brandon Prins, “Taming the Leviathan,” Journal of Peace Research 45, no. 5 (2008):613-631; and Douglas Gibler, “Outside-In: The Effect of External Threat on State Centralization,” Journal of Conflict Resolution 54, no. 4 (2010):519-542. Mohammad Ayoob argues that time is the most significant differences between European (centuries) and post-colonial (decades) state making. See his: The Third World Security Predicament (Boulder: Lynne Rienner Publishers, 1995), especially Chapter 2. Tilly (note 1); among Kiser’s many studies see: Edger Kiser and April Linton, “Determinants of the Growth of the State,” Social Forces 80, no. 2 (2001): 411-448. Youssef Cohen, Brian Brown, and A. F. K. Organski, “The Paradoxical Nature of State Making,” American Political Science Review 75, no. 4 (1981):901-910, p.902. On the state-to-nation balance and its implications for war and peace, see Benjamin Miller, States, Nations and the Great Powers: The Sources of Regional War and Peace (Cambridge: Cambridge University Press, 2007). Charles Tilly. ‘Reflections on the history of European state-making’, in Charles Tilly, (ed.) The Formation of National States in Western Europe (Princeton: Princeton University Press, l975) 3-83, Charles Tilly, ‘Western state-making’, in Charles Tilly (ed.) The Formation of National States in Western Europe (Princeton: Princeton University Press. 1975) pp. 601-638; Charles Tilly, ‘War making and state making as organized crime’, in Peter B. Evans, et al. (eds. ), Bringing the State Back In (New York: Cambridge University Press, 1985), 169-191. K. J. Holsti, War, The State, and the State of War (Cambridge: Cambridge University Press, 1996); Mohammed Ayoob, The Third World Security Predicament (Boulder: Lynne Rienner, 1995). Boaz Atzili, Good Fences, Bad Neighbors: Border Fixity and International Conflict (Chicago: the university of Chicago Press, 2012). For instance, see Tim Harford and Michael Klein, “Aid and Resource Curse,” Public Policy for the Private Sector, note number 291 (April 2005); Deborah Brautigam and Stephen Knack, “Foreign Aid, Institutions and Governance in Sub-Saharan Africa,” Economic Development and Cultural Change 52, no. 2 (2004): 255-86; Michael Klein and Tim Harford, The Market for Aid (Washington DC: International Finance Corporation, 2005). Michael Lewin Ross, “Does Oil Hinder Democracy?” World Politics 53, no. 3 (April 2001): 327-28. Michael L. Ross, The Oil Curse (Princeton: Princeton University Press, 2012). Jeffrey Herbst, States and Power in Africa (Princeton, NJ: Princeton University Press, 2000). Miguel Angel Centeno, Blood and Debt: War and the Nation-State in Latin America (University Park: Pennsylvania State University Press, 2002); Mary Callahan, Making Enemies: War and State-building in Burma (Ithaca: Cornell University Press, 2003). For statistical Studies, see Lemke, footnote 3 in this roundtable. Charles Tilly, “War Making and State Making as Organized Crime,” in Bringing the State Back In, ed. Peter B. Evans, Dietrich Rueschemeyer and Theda Skocpol (Cambridge: Cambridge University Press, 1985), 169-91.